"Steven Jones (above, left) admitted today that he and other 9/11 researchers "screwed up on the collapse time of WTC 7. We blew it." "Responding to the overnight controversy, Steven Jones announced this morning that WTC 7 did indeed take over 13 seconds to collapse. 'We screwed up. We had never seen the CBS video when we claimed that it took WTC 7 6.5 seconds to collapse. We only relied on the street video that does not show the Penthouses. By the time we saw the CBS video, we had so much invested in the 6.5-second collapse time, we could not disappoint our supporters who were successfully using the 6.5 free fall time to push 9/11 Truth. We just ignored the evidence.' "
I supposedly said this in May, 2007. No, I never said that and it is simply not true. I first saw this CBS video in 2005 and I have shown it many times, starting in 2005. I have repeatedly noted that I began timing when the corner of the roof begins to move, and that is how I derived the near-free-fall time of 6.5 seconds for the WTC7 roof-fall. To have me say, "We just ignored the evidence" is grossly incorrect, unfair and despicable. I really am appalled that someone (the blog is ascribed to a "B. J. Edwards") would stoop to putting fallacious words in my mouth, inventing his deception whole cloth. The false and defamatory blog continues: "Asked how his revelation would affect 9/11 Truth, Jones said it would enhance and strengthen it." I wish to add that the fall-time argument has now been corroborated and augmented by free-fall acceleration data, which I find especially compelling. A graph of the velocity versus time for the WTC 7 roof by David Chandler demonstrates free-fall acceleration for over 100 feet. David Chandler and I both publicly challenged NIST on their initial WTC 7 report in August 2008, and NIST correspondingly made a major correction and admitted in their final report that indeed Building 7 demonstrates free-fall ACCELERATION -- which means nothing in the way impeding the motion -- for over 100 feet. Physicist Chandler explains this very well in his videos, here: http://www.911speakout.org/ See especially the video, "WTC7: NIST finally admits free fall." I like seeing this... setting the record straight. My ears get red when other people twist or pervert or misquote or take out of context what someone says. And this collapse time is an especially important issue. My ears were burning. I am glad that you made this public, Professor. TomT on Mon, 08/23/2010 - 9:26pm. I remember seeing this but didn't give it much thought because it sounded somewhat odd. I'm glad to see this clarification. geoffritchey on Tue, 08/24/2010 - 9:08am. I also wanted to highlight the work of David Chandler. ProfJones on Tue, 08/24/2010 - 9:32am. In the video, he claims that the temperature of 400 C your research team recorded for the reaction of the bi-layered red/gray chips of nanothermite discovered in various samples of 9/11 WTC dust could not be thermite because thermite ignites at 850-900 C.
Either way, I hope you can clear the air with Dave Thomas by explaining your position on this issue, maybe by posting something under the comments section of his video. What he has said sounds a lot like misinformation to me. I guess it's good at least that his experiments also prove that even regular thermite burns through solid steel beams. Hope you are well and thanks for explaining the mishap with the blog in which you were misquoted (although I've never had any doubts about your integrity as a person or as a scientist). Mekt_Ranzz on Wed, 08/25/2010 - 1:26pm. and his comments about ignition temperature reveal he knows nothing about nanochemistry. P.S. Tillotson's DSC test was conducted in air, just like Jones/Harrit et al. SnowCrash on Wed, 08/25/2010 - 1:46pm. "reveal he knows nothing about nanochemistry. " reveals he knows plenty about obfuscation. Joe on Wed, 08/25/2010 - 4:46pm. 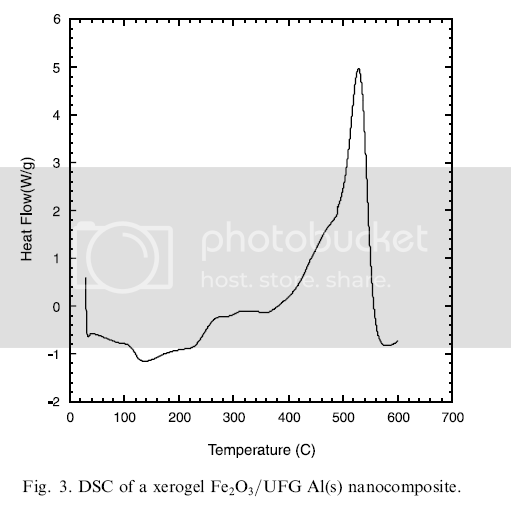 Indeed, we show in this very paper the result of a DSC test using known nano-thermite, and the ignition temperature is much less than 850-900 C.
DSC traces show completion of reaction at temperatures below 560 ˚C. There is also discussion of the ignition temp in the paper. David Thomas must have missed all this -- if he even read our paper! ProfJones on Thu, 08/26/2010 - 3:39pm.